The two researchers independently extracted the data. In the first step, the title and the abstract of each article was carefully scrutinized. In the next step, studies were evaluated in terms of methodology quality and appropriate entry criteria by two researchers independently without considering the results [Table 1] and [Table 2]. The methodology quality of studies was evaluated by two researchers on the basis of how they minimized bias and error in their work. Studies were classified based on the PRISMA,, Jadad, and Cochrane Library guidelines as high or low quality. For example, objectives, the comparison of the control and intervention group, the population studied, and information about the results were reported in high-quality studies. The quality validation and evaluation of the studies included random method, concealment and random allocation, blindness, incomplete results, selective result reporting, and complete follow-up. The selection of the results was agreed upon by both researchers based on an assessment of the scales in [Table 3]. In this assessment, the scores ≥3 were considered as high quality and scores ≤2 as poor quality., Further coordination, later, helped resolve the controversies between the authors. The extracted data for each study included the primary outcome of weight gain during pregnancy and secondary outcomes such as maternal and neonatal complications, gestational diabetes, preeclampsia, gestational hypertension, preterm delivery, cesarean delivery, neonatal macrosomia (>4000 g); birth weight; intrauterine growth retardation; and low birth weight ≤2500 g, and their Apgar scores are summarized in [Table 4] and [Table 5]. The evaluation process is shown in [Figure 1], and the selected articles and the results of review are summarized in [Table 3] and [Table 4]. A total number of 1043 studies were evaluated by searching in electronic sources. About 1027 studies were excluded by endnote in the first phase after the duplication review. Out of 210 studies, 193 studies were excluded due to lack of inclusion criteria and 17 papers' randomized clinical trials (on 5475 pregnant women) were matched and evaluated; among these, 7 articles studied the physical activity (1499), 3 articles reviewed diets (3089), 6 probed the lifestyle interventions (1125), and 1 article was on counseling (122). In general, evidence suggested how the physical activity and proper diet impacts on proper weight-gain during pregnancy, prevents maternal complications, and improves the outcome of pregnancy. According to systematic review done, the most appropriate intervention for pregnant women with MetS indicators is the combination of physical activity and diet that is provided by an obstetrician's with nutritionist assistance. 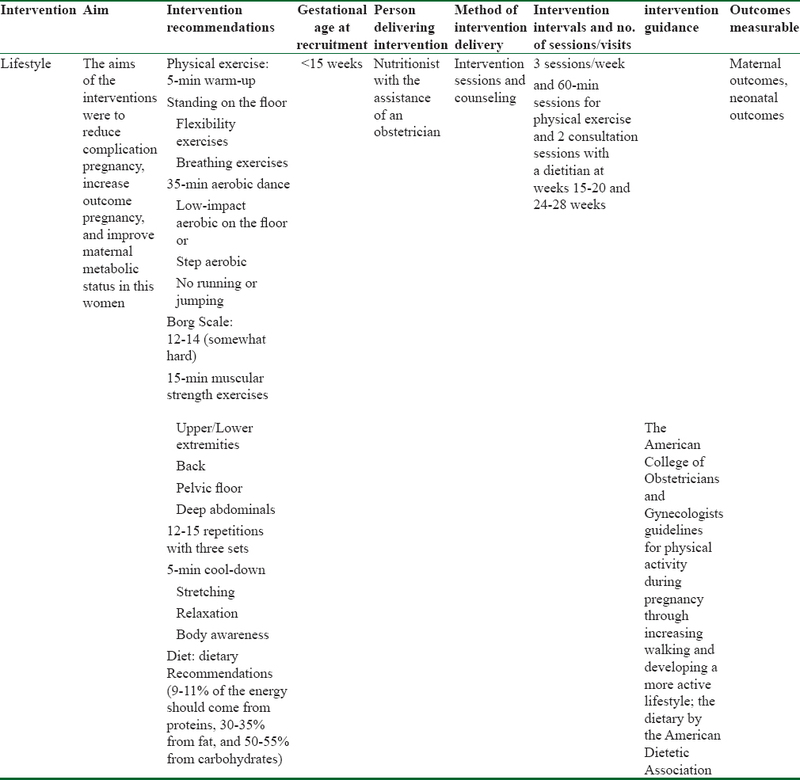 According to the American College of Obstetricians and Gynecologists, guidelines for physical activity during pregnancy through increasing walking and developing a more active lifestyle and the dietary by the American Dietetic Association are summarized in [Table 6]. Grundy SM, Brewer HB Jr, Cleeman JI, Smith SC Jr, Lenfant C. Definition of metabolic syndrome: Report of the National Heart, Lung, and Blood Institute/American Heart Association conference on scientific issues related to definition. Arterioscler Thromb Vasc Biol 2004;24:e13-8. Hamidreza Barahimi MD AEP FR, Akbar Hasanzadeh PhD, Omolbanin Kafeshani MSc. Association of dietary pattern and metabolic syndrome in 15- to 49-years-old women. J Isfahan Med School 2015;33:70-81. Hajian-Tilaki K. Metabolic syndrome and its associated risk factors in Iranian adults: A systematic review. Caspian J Intern Med 2015;6:51-61. Organization WH. Cancer control: Knowledge into action: WHO guide for effective programmes: World Health Organization, 2007. Villanueva Sagrado Ma, Ullrich A, World Health O. Cancer control: Knowledge into action: WHO guide for effective programmes. Module 2, Module 2. Geneva: WHO; 2007. Vahid S, Sahar G, Mohammadtaghi S, Maryam E, Shirin TJ, Ali E. The frequency of metabolic syndrome among female patients admitted in psychiatry ward. Med J Mashhad Univ Med Sci 2012;54:230-7. Delavari A, Forouzanfar MH, Alikhani S, Sharifian A, Kelishadi R. First nationwide study of the prevalence of the metabolic syndrome and optimal cutoff points of waist circumference in the Middle East. Diabetes Care 2009;32:1092-7.
dos Prazeres Tavares H, Arantes MA, Tavares SBMP, Abbade JF, Calderon IdMP, Rudge MVC. Metabolic syndrome and pregnancy, its prevalence, obstetrical and newborns complications. Open J Obstet Gynecol 2015;5:618-25. Bartha JL, Marín-Segura P, González-González NL, Wagner F, Aguilar-Diosdado M, Hervias-Vivancos B. Ultrasound evaluation of visceral fat and metabolic risk factors during early pregnancy. Obesity 2007;15:2233-9. Gluckman PD, Hanson MA, Cooper C, Thornburg KL. Effect of in utero and early-life conditions on adult health and disease. N Engl J Med 2008;359:61-73. Bhowmik B, Afsana F, Siddiquee T, Munir SB, Sheikh F, Wright E, et al. Comparison of the prevalence of metabolic syndrome and its association with diabetes and cardiovascular disease in the rural population of Bangladesh using the modified National Cholesterol Education Program Expert Panel Adult Treatment Panel III and International Diabetes Federation definitions. J Diabetes Investig 2015;6:280-8. Bartha JL, González-Bugatto F, Fernández-Macías R, González-González NL, Comino-Delgado R, Hervías-Vivancos B. Metabolic syndrome in normal and complicated pregnancies. Eur J Obstet Gynecol Reprod Biol 2008;137:178-84. Isezuo SA, Ekele BA. Comparison of metabolic syndrome variables among pregnant women with and without eclampsia. J Natl Med Assoc 2008;100:1059-62. Chatzi L, Plana E, Daraki V, Karakosta P, Alegkakis D, Tsatsanis C, et al. Metabolic syndrome in early pregnancy and risk of preterm birth. Am J Epidemiol 2009;170:829-36. Hooijschuur MC, Ghossein-Doha C, Al-Nasiry S, Spaanderman ME. Maternal metabolic syndrome, preeclampsia, and small for gestational age infancy. Am J Obstet Gynecol 2015;213:370.e1-7. Kianpour M, Norozi S, Bahadoran P, Azadbakht L. The relationship between metabolic syndrome criteria and preeclampsia in primigravid women. Iran J Nurs Midwifery Res 2015;20:263-8. Rodie VA, Freeman DJ, Sattar N, Greer IA. Pre-eclampsia and cardiovascular disease: Metabolic syndrome of pregnancy? Atherosclerosis 2004;175:189-202. Young B, Hacker M, Rana S. Pre-eclampsia and risk of cardiovascular disease and cancer in later life: Systematic review and meta-analysis. Hypertens Pregnancy 2012;31:50-8. Negrato CA, Jovanovic L, Tambascia MA, Calderon IdMP, Geloneze B, Dias A, et al. Mild gestational hyperglycaemia as a risk factor for metabolic syndrome in pregnancy and adverse perinatal outcomes. Diabetes Metab Res Rev 2008;24:324-30. Ryckman KK, Borowski KS, Parikh NI, Saftlas AF. Pregnancy complications and the risk of metabolic syndrome for the offspring. Curr Cardiovasc Risk Rep 2013;7:217-23. Gonzalez-Bulnes A, Ovilo C, Astiz S. Transgenerational inheritance in the offspring of pregnant women with metabolic syndrome. Curr Pharm Biotechnol 2014;15:13-23. Catov JM, Bodnar LM, Kip KE, Hubel C, Ness RB, Harger G, et al. Early pregnancy lipid concentrations and spontaneous preterm birth. Am J Obstet Gynecol 2007;197:610.e1-7. Sattar N, Greer IA. Pregnancy complications and maternal cardiovascular risk: Opportunities for intervention and screening? BMJ 2002;325:157-60. Hou R-L, Jin W-Y, Chen X-Y, Jin Y, Wang X-M, Shao J, et al. Cord blood C-peptide, insulin, HbA1c, and lipids levels in small-and large-for-gestational-age newborns. 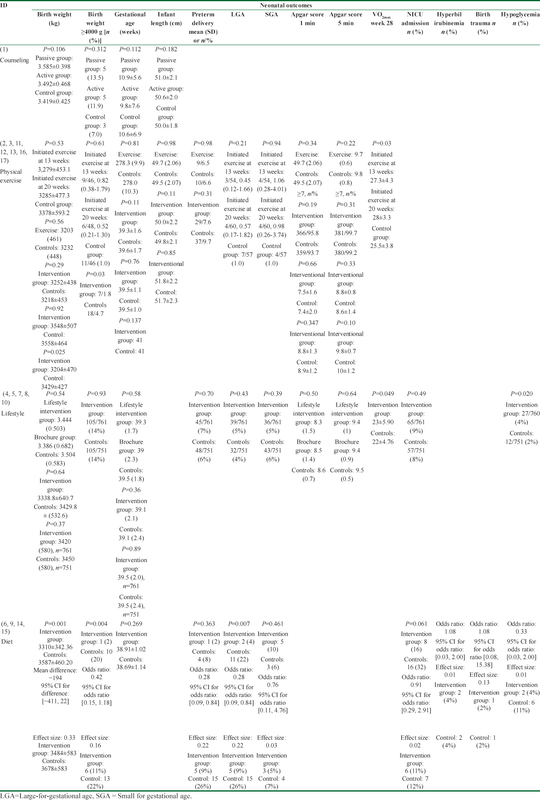 Med Sci Monit 2014;20:2097-105. Maleki F, Sayehmiri F, Kiani F, Nasiri S. Metabolic syndrome prevalence in Iran: A systematic review and meta-analysis. J Kermanshah Univ Med Sci 2014;18:242-50. Saeed S, Nasab MM, tarahi MJ. Prevalence of overweight and obesity in 64-25 year-old population of Khorramabad city, 1385. J Diabet Lipid Disord 2009;8:167-76. Liberati A, Altman DG, Tetzlaff J, Mulrow C, Gotzsche PC, Ioannidis JP, et al. The PRISMA statement for reporting systematic reviews and meta-analyses of studies that evaluate healthcare interventions: Explanation and elaboration. BMJ (Clinical research ed). 2009;339:b2700. Higgins JP, Green S. Cochrane handbook for systematic reviews of interventions. John Wiley & Sons; 2011. Lei JH, Liu LR, Wei Q, Yan SB, Song TR, Lin FS, et al. 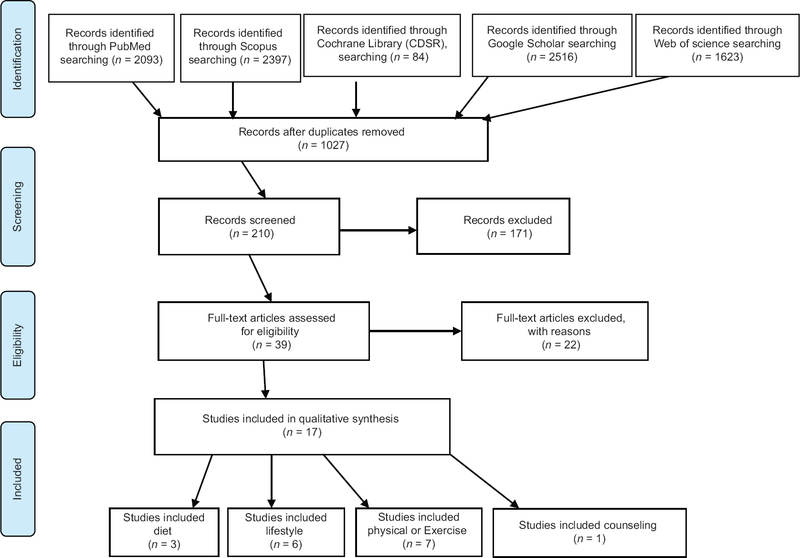 Systematic review and meta-analysis of the survival outcomes of first-line treatment options in high-risk prostate cancer. Sci Rep 2015;5:7713. Halpern S, Douglas M. Jadad scale for reporting randomized controlled trials. Evidence-Based Obstet Anesth 2005:237-8. Guelinckx I, Devlieger R, Mullie P, Vansant G. Effect of lifestyle intervention on dietary habits, physical activity, and gestational weight gain in obese pregnant women: A randomized controlled trial. Am J Clin Nutr 2010;91:373-80.
de Oliveria Melo AS, Silva JLP, Tavares JS, Barros VO, Leite DF, Amorim MM. Effect of a physical exercise program during pregnancy on uteroplacental and fetal blood flow and fetal growth: A randomized controlled trial. Obstet Gynecol 2012;120:302-10. Barakat R, Pelaez M, Lopez C, Montejo R, Coteron J. Exercise during pregnancy reduces the rate of cesarean and instrumental deliveries: Results of a randomized controlled trial. J Matern Fetal Neonat Med 2012;25:2372-6. Adamo KB, Ferraro ZM, Goldfield G, Keely E, Stacey D, Hadjiyannakis S, et al. The Maternal Obesity Management (MOM) Trial Protocol: A lifestyle intervention during pregnancy to minimize downstream obesity. Contemp Clin Trials 2013;35:87-96. Bogaerts A, Devlieger R, Nuyts E, Witters I, Gyselaers W, Van den Bergh B. Effects of lifestyle intervention in obese pregnant women on gestational weight gain and mental health: A randomized controlled trial. Int J Obes 2013;37:814-21. Deveer R, Deveer M, Akbaba Et, Engin-Ustun Y, Aydogan P, Celikkaya H, et al. The effect of diet on pregnancy outcomes among pregnant with abnormal glucose challenge test. Eur Rev Med Pharmacol Sci 2013;17:1258-61. Hawkins M, Hosker M, Marcus B, Rosal MC, Braun B, Stanek E, et al. A pregnancy lifestyle intervention to prevent gestational diabetes risk factors in overweight Hispanic women: A feasibility randomized controlled trial. Diabet Med 2015;32:108-15. Vinter C, Jørgensen J, Ovesen P, Beck-Nielsen H, Skytthe A, Jensen D. Metabolic effects of lifestyle intervention in obese pregnant women. Results from the randomized controlled trial 'Lifestyle in Pregnancy'(LiP). Diabet Med 2014;31:1323-30. Vesco KK, Karanja N, King JC, Gillman MW, Leo MC, Perrin N, et al. Efficacy of a group-based dietary intervention for limiting gestational weight gain among obese women: A randomized trial. Obesity 2014;22:1989-96. Poston L, Bell R, Croker H, Flynn AC, Godfrey KM, Goff L, et al. Effect of a behavioural intervention in obese pregnant women (the UPBEAT study): A multicentre, randomised controlled trial. Lancet Diabet Endocrinol 2015;3:767-77. Haakstad LA, Edvardsen E, Bø K. Effect of regular exercise on blood pressure in normotensive pregnant women. A randomized controlled trial. Hypertens pregnancy. 2016;35:170-80. Barakat R, Pelaez M, Cordero Y, Perales M, Lopez C, Coteron J, et al. Exercise during pregnancy protects against hypertension and macrosomia: Randomized clinical trial. Am J Obstet Gynecol 2016;214:649.e1-8. Aparicio VA, Ocón O, Padilla-Vinuesa C, Soriano-Maldonado A, Romero-Gallardo L, Borges-Cósic M, et al. Effects of supervised aerobic and strength training in overweight and grade I obese pregnant women on maternal and foetal health markers: The GESTAFIT randomized controlled trial. BMC Pregnancy Childbirth 2016;16:290. Ryu A, Kim TH, Park YJ, Enkhbold T. Re: Self-weighing and simple dietary advice for overweight and obese pregnant women to reduce obstetric complications without impact on quality of life: A randomised controlled trial. BJOG 2017;124:697-8. Al Wattar BH, Dodds J, Placzek A, Spyreli E, Moore A, Hooper R, et al. Effect of simple, targeted diet in pregnant women with metabolic risk factors on maternal and fetal outcomes (ESTEEM): Study protocol for a pragmatic multicentre randomised trial. BMJ Open 2016;6:e013495. Tinius RA, Cahill AG, Cade WT. Impact of physical activity during pregnancy on obstetric outcomes in obese women. Journal Sports Med Phys Fitness 2017;57:652-9. Barakat R, Pelaez M, Lopez C, Lucia A, Ruiz JR. Exercise during pregnancy and gestational diabetes-related adverse effects: A randomised controlled trial. Br J Sports Med 2013;47:630-6. Yazdy MM, Liu S, Mitchell AA, Werler MM. Maternal dietary glycemic intake and the risk of neural tube defects. Am J Epidemiol 2009;171:407-14.